Protesters hold up signs during the March for Science Chicago on Saturday. Organizers estimated that roughly 50,000 people participated in the march. CHICAGO — Thousands of students, educators and scientists gathered in downtown Chicago on Saturday to participate in the March for Science, one of hundreds of such marches held worldwide on Earth Day. The march was a response to President Donald Trump’s election and, more recently, an executive order that threatened to remove existing legislation that combats climate change. March director Kristian Aloma (Communication ’02) told The Daily roughly 50,000 people showed up on Saturday, 10,000 more than organizers expected. He said he hoped the organization behind the March for Science in Chicago would continue to operate after the protest. 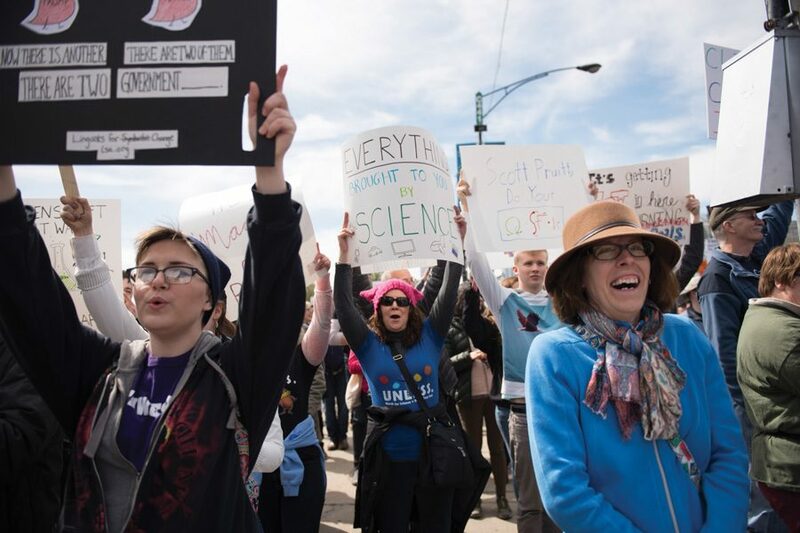 Before marching, protesters assembled along Columbus Drive to hear five speakers — including Emily Graslie, chief curiosity correspondent at the Field Museum — discuss the importance of society’s role in science. However, marchers carried signs that referenced Trump’s policies and executive orders with phrases like “Protect Bees, Not Borders.” Other signs played off Hillary Clinton’s presidential campaign slogan, saying “I’m with her” pointing to a picture of the Earth. Demonstrators said they came to the march for a variety of reasons, including protesting Trump’s policies, raising awareness for science explorations and celebrating the advances science has made throughout history. First-time protester and McCormick freshman Kayla Carter said she attended the march hoping to raise awareness about the future of the Environmental Protection Agency. Trump’s administration has proposed cutting the EPA’s budget by 31 percent, which would eliminate a quarter of its 15,000 jobs. At the exposition, representatives from various science organizations and activist groups displayed their current research, gathered support and demonstrated science experiments to get children involved. McCormick Prof. Alex Birdwell, who attended the march with his family, said the exposition was an opportunity for protesters to get involved with the scientific community.